Some people simply hear the word morning and cannot function. For me, sunrise is a time to get inspired, eat a delicious breakfast and get s*** done. I never had trouble getting out of bed as a teenager. I would only occasionally moan about getting up early if I was struggling to sleep (need to get those 8 hours!). In my last flat, when it was too cold to shower until about midday, my mornings weren't so productive as I was more occupied trying to thaw out my body. Student living at it's finest. Now I'm moved into a new flat, things are looking up and so are my mornings. Since turning vegan and my energy levels have shot up, there is no need for coffee as my pick me up. Decaf please! Which is great news for me as caffeine does shake me up a bit. As an anxious person, knowing I have plans or appointments in the afternoon usually results in me constantly looking at the clock and puts me off making plans for the rest of the day. Weird, I know. On the other hand morning plans leave me in a productive mood for the rest of the day. Maybe 7:30am starts aren't so bad after all? Exercising - I'm not talking as soon as I jump out of bed but I like to get it over and done with! From a cave-like student flat to what feels like a gleaming palace, I am now settled into my new flat. The word settled meaning finally having internet. I had to spend a good few weeks waiting for it to be installed and oh boy, I did not realise how much I rely on it. Instagram, Facebook and Twitter was accessible through my phone but blogger was a big no. At least it gave me time to think about what I really want to do with my blog and upcoming posts. A new flat means serious homeware shopping. 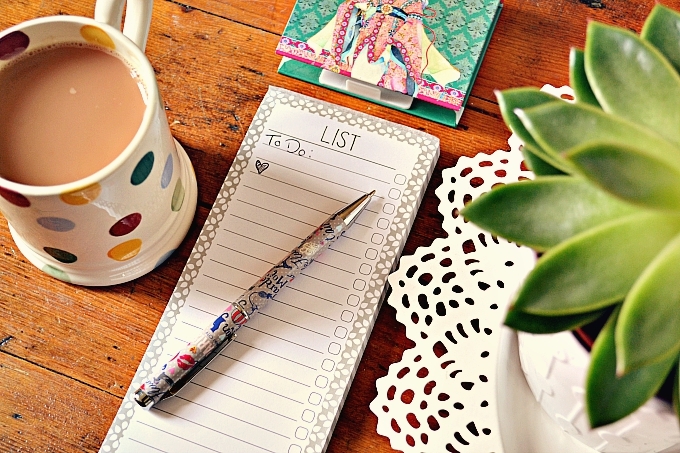 Anyone else get more excited about homeware shopping than clothes shopping? I bought this very instagramable jar and straw from a country chic shop in Cornwall whilst visiting family. 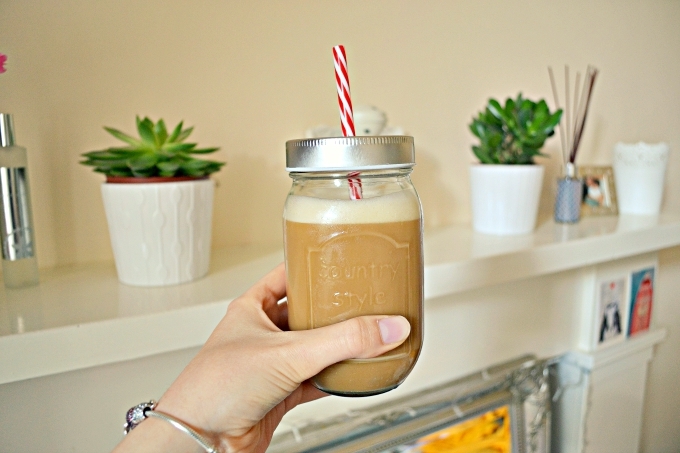 Perfect for juices, iced coffee or simply water. I find them much more satisfying to drink out of, guilty pleasure! 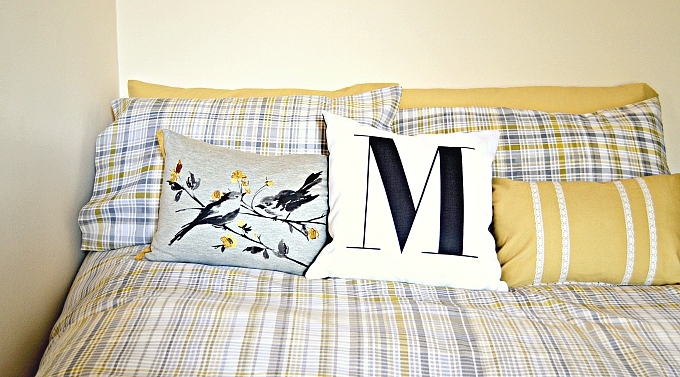 Next have a beautiful range of bedding and in the end I decided on a grey, white and yellow colour scheme. Different from my usual pink and white but I really love it. Fresh and bright with cushions (also from Next) and a grey throw to make it feel cosy. 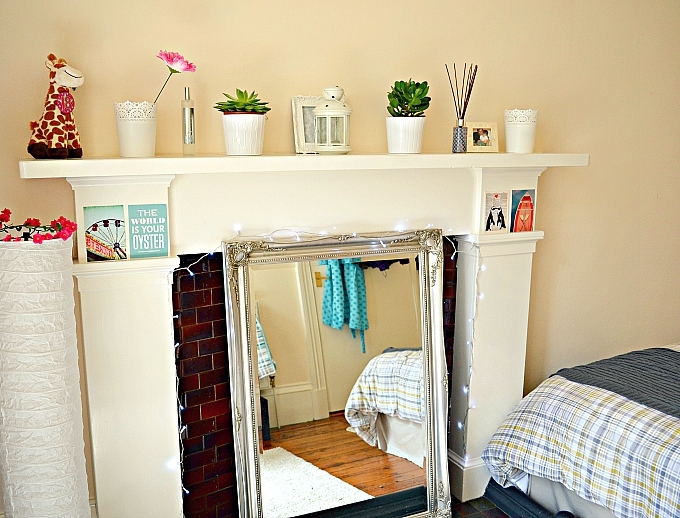 The fireplace in my room is my favourite part of the flat. It will probably get changed a billion times but I'm really happy with the way it looks at the moment. The plants are from IKEA along with the white lantern and pots. I love having snippets of inspiration lying around to brighten up my day so I bought the postcards from Paperchase. My favourite is "the world is your oyster". A great morning pick me up! Little side note: I am starting a YouTube channel very soon all about healthy eating and my vegan lifestyle so look out for links and videos! Anxiety isn't easy. Actually, it is anything but easy. It can be overwhelming, unexpected and challenging to deal with. I'm not just talking about the butterflies you get before an exam or first date nerves. Anxiety is one of the most common mental health problems in the UK. In recent years I have noticed more and more people speak about it openly, and being a sufferer of anxiety myself, I know how helpful it can be reading about how others deal with their experiences. It has taken me years understand my anxiety and accept it. Not everyone is the same and different techniques work better for some than others. These are tips that have been given to me over the years or I have tried and tested myself. Learn to stop worrying about the things you have zero control over. These worries are an unnecessary burden to add to your anxiety. This isn't always easy, I'm a natural worrier myself, but it does help a lot. In my past, dealing with family illnesses was the hardest because as much as I wanted to take control there was absolutely nothing I could do but support family members and tell myself what will be will be. Even now that saying makes me shiver but unfortunately it is very true. "Yes". Saying this word can be scary. It can be so easy to stay in bed, skip lectures, miss social gatherings or amazing opportunities that come your way. Why is this? Because it can be scary trying something new, the unknown. However, wipe away those negative thoughts. Immediately. Now think to yourself how amazing it could be. How every tiny experience can shape you as a person and ultimately push you into new directions. I find the more I do something, the less scary it becomes. If you have a bad experience, remember you are allowed to have those. Avoid what causes unbearable anxiety and start with the smaller challenges. Work your way up and defeat them one at a time. All you need is the initial push and the only one who can do that is you. Caffeine, sugar and alcohol can intensify the feeling of anxiety. Instead of cutting them out of your diet, try to reduce your consumption of these during anxious periods. Caffeine is good during exams for those early morning study sessions but not to the extent you are a full blown trembling wreck. Keeping sugar levels steady is important. Massive fluctuations can put me on a bit of a roller-coaster ride. 4pm slump anyone? No thanks. Lastly, alcohol. Hahaha, this little culprit. Sometimes alcohol can actually help with my anxiety and takes the edge off social situations. Though, it really is Russian roulette, and can occasionally heighten any underlying feelings of anxiety. 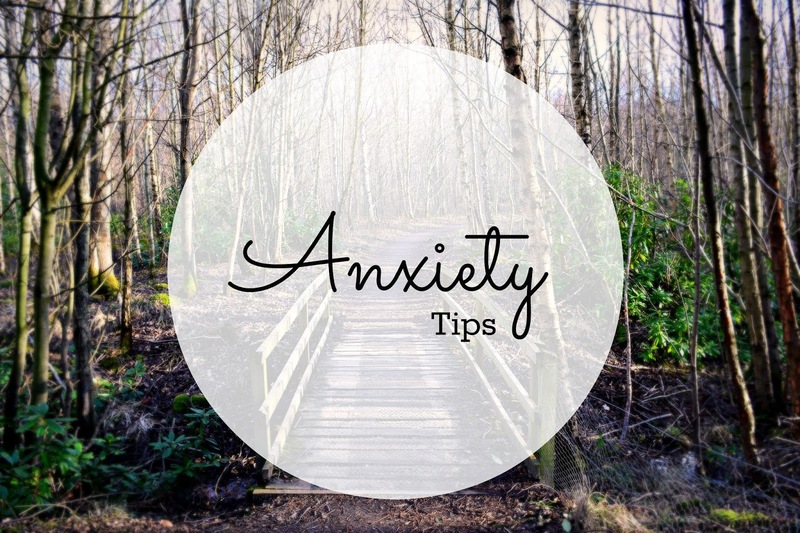 My main tip is to be careful and aware of how these can affect you when you are anxious and limit them when you can. Sleep really does help me have a clear mind. If I'm tired I struggle with motivation a lot, which then leads to heightened anxiety as I feel I'm not working to the best of my ability. Also getting into a routine, especially over exams or a stressful period, can help with getting quality sleep. Yes the dreaded exercise tip. For those of you who do not go to the gym, don't worry. Even a walk on a nice day, going for a swim can boost your mood or some super easy yoga. It really is true what they say, exercise makes you feel better mentally and can boost confidence as well. Usually hard to find, but a good self help book can come in handy. This is more for day to day anxiety and keeping a good mindset. My recent favourite is Flip It. It has allowed me to think of situations when I normally get anxious and open my mind up to alternative thought tracks. A very worthy purchase. Sometimes anxiety can be very unexpected so applying these tips in moments like this can be a challenge. Training yourself to gradually become more aware of your mood slipping into an anxious state is the first step to controlling it. I am continuously learning about what triggers my anxiety attacks and what methods are best for coping with them. I have come to realise that anxiety doesn't just disappear, it only gets easier to deal with. This happens over time and it is a learning journey. Don't let it defeat you and stay strong! 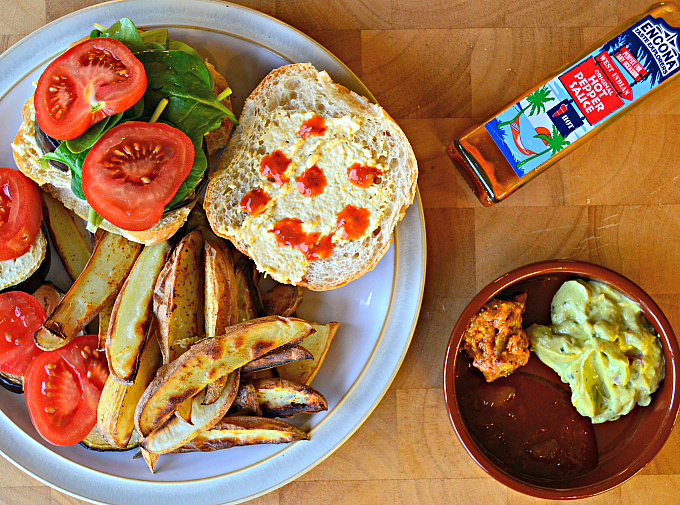 Spicy Aubergine Burgers and Rustic Chips | Going Vegan? No oil, no dairy and no meat. I have been loving vegan meals lately. Filling, colourful and packed with flavour, this plate is a great alternative to your typical beef burger and fried chips. Vegetarian and vegan meals really should not be scary! They give me more energy and don't leave me feeling sluggish. I was going through a period of crash dieting and then trying to eat "healthy" but really I wasn't providing myself with enough nutrients and was severely lacking plant-based energy sources. Since reading blog after blog, watching hours of YouTube videos and Instagram stalking vegan foodies, I feel a lot more educated about the plant based way of life. When I told my parents I wanted to make my own meal instead of having a curry they were a little taken aback. I don't blame them, I love food and curry is a favourite of mine, but it was the additional comments that got to me. "She's just going through a phase" or "Where will you get your protein" are a few examples.Something has changed about my outlook on food and I believe it started when I watched some vegan documentaries and talks on the internet just over a month ago. Since then, the thought of meat makes me feel sick and I feel no need what-so-ever to consume dairy. Especially when there are so many alternatives out there! Cut the potatoes into wedge shaped slices (similar sized) and put on a tray with tin foil or baking paper. Dust these with some cumin and paprika (optionally salt as well), then place in the oven at 200 degrees. Cut the aubergine into the thickness you want and place on a separate tray (I usually do more than one to fill out the bun). Add some salt and garlic powder. The aubergine is cooked best when you can put a fork through it pretty easily. Make sure whilst the last bits are cooking to prep your bread roll with houmous and sauce, slice you tomatoes and collect any dips for your chips! The chips usually take about 40 minutes depending on the size but test them to double check. Simply put the baked aubergine in the roll, add the spinach and tomato and there you have it! Get creative with this and put your own spin on it. I always change it up a little when I do this meal for myself. Great if you have veggies that need to be eaten up! What is your easy go to meal? Ahhh, Sunday. Finally my exams are over and Sundays can be enjoyed again. 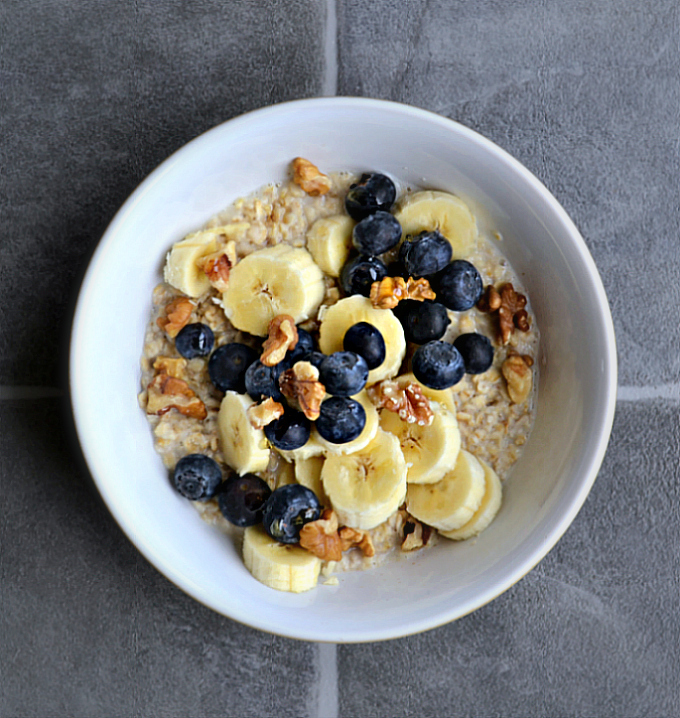 This weekend I am at home and the cupboards are full of wonderful breakfast toppings. 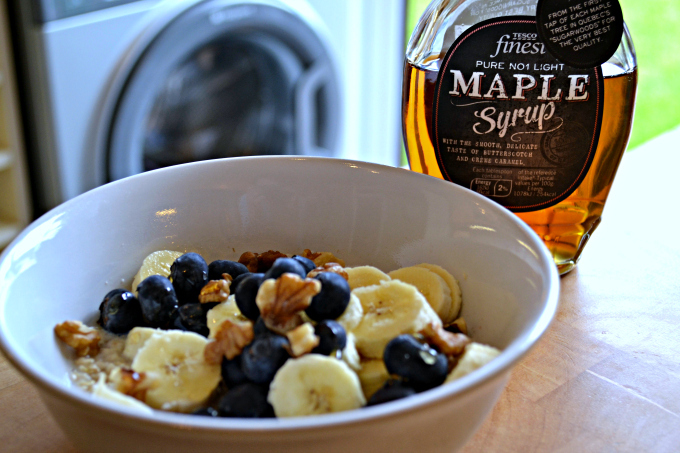 Today I decided to have some oats with warmed Oatly milk, banana, blueberries, walnuts and a drizzle of maple syrup. Delicious! With university exams sucking every little motivation from my body, Pinterest is there to keep me inspired when I need it. 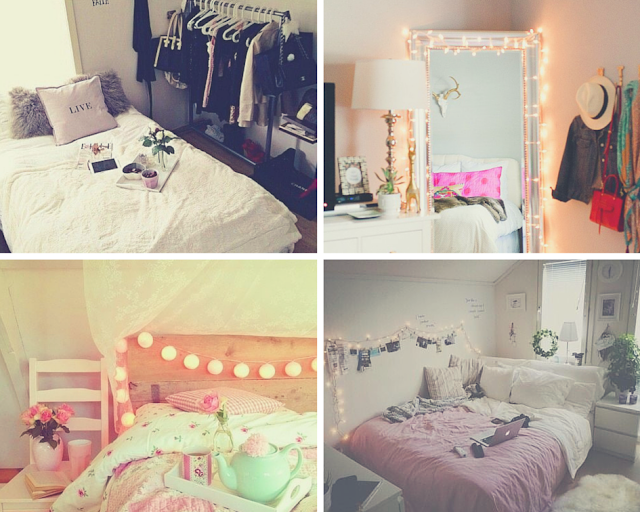 The general theme of my pinterest boards and tumblr reblogs at the moment is mainly based around summer fashion, vegetarian foods, yoga and beautiful bedrooms. 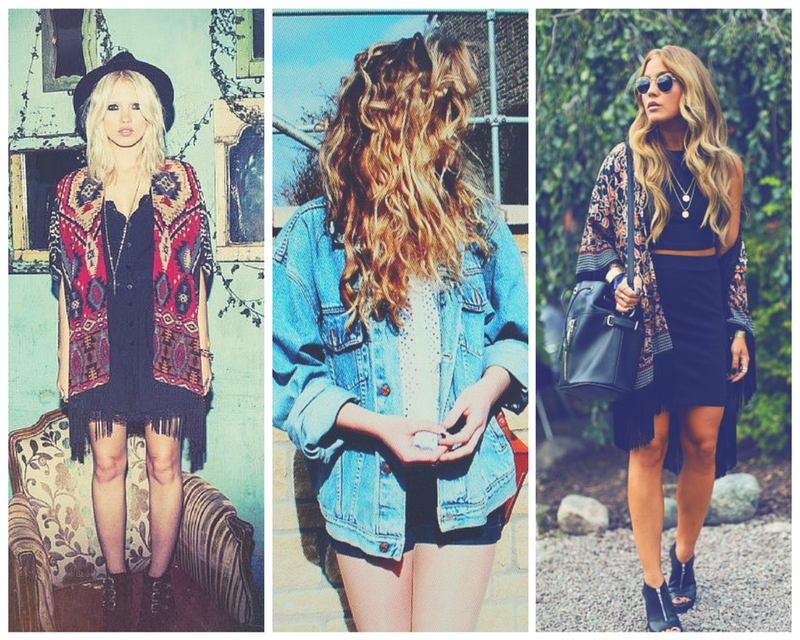 Kimono's are basically fashionable blankets and I love them. Instead of taking a jacket to a club, they are great to keep you warm in the queue whilst still rocking your outfit. Yes please. I am also on the hunt for an over-sized denim jacket. This calls for a major charity shop raid. Mouth watering right? 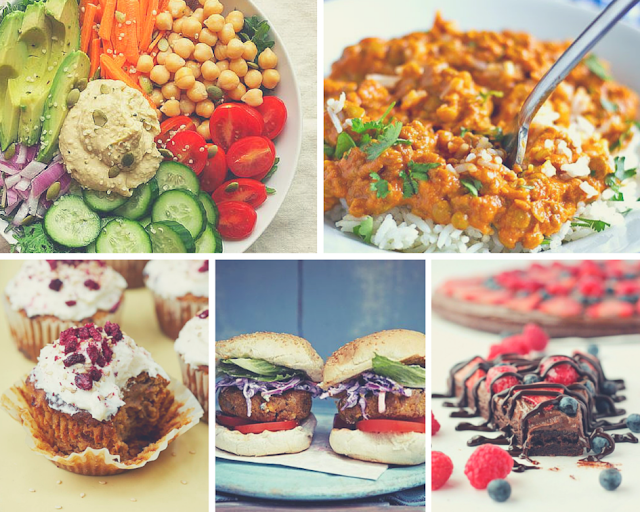 Pinterest is my main source of food inspo and I have been loving vegan and vegetarian choices lately. I'm actually considering going full on vegetarian because I'm not a big meat eater anyway and I usually prefer meat alternatives. I want to master chickpea burgers and curries, create an Instagram worthy salad like the one above and get my baking game on! My goal this summer is to regain my flexibility. Since I stopped doing cheerleading last year, I haven't kept up with stretching and I regret doing so. I have already found some YouTube channels I love and when I move into my new flat, my yoga mission will be in full swing. I'll keep you updated. The idea of having a blank canvas bedroom to decorate is making me so excited! The fairy lights around the big mirror is a must, though I'm not quite sure on what colours to go for yet. One thing I do know is that it will be cosy with lots of candles. I am tempted to get a clothing rail like the one above to put my favourite dresses on but it might take up too much room. Hmmm, decisions! The mac raincoat is a must when living in the UK and I love the fact that this one is see through so you can still show off your outfit without covering up. Perfecto! My ideal outfit would involve fringing or crochet with high waisted shorts and a crap load of jewellery, topped off with my favourite sunglasses. 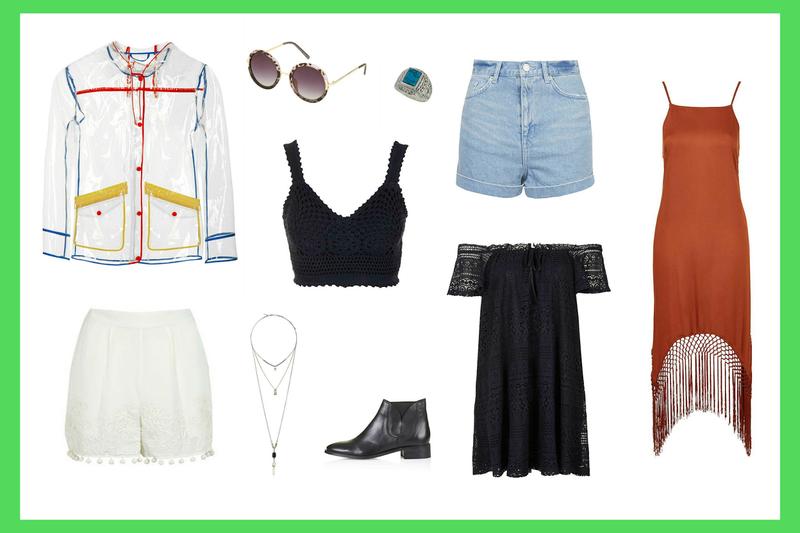 What are your festival staples? Hello! 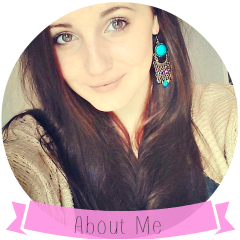 My name is Megan, I am 19 years old and currently at university studying Pharmacology. I have an obsession with bananas (nice cream anyone? ), fantasise way too much about road tripping the world and dream of one day opening my own gluten free vegan cafe.